9/11, Memes, and 🤖: 15 YEARS SINCE 9/11 ANDWE STILL HAVE NO SYSTEMTOTRACK THE ENTRY/EXIT OF FOREIGN CITIZENS SHARE IF YOUAGREETHAT'S UNACCEPTABLE! Nearly 500,000 foreign visitors overstayed their visa in 2015. 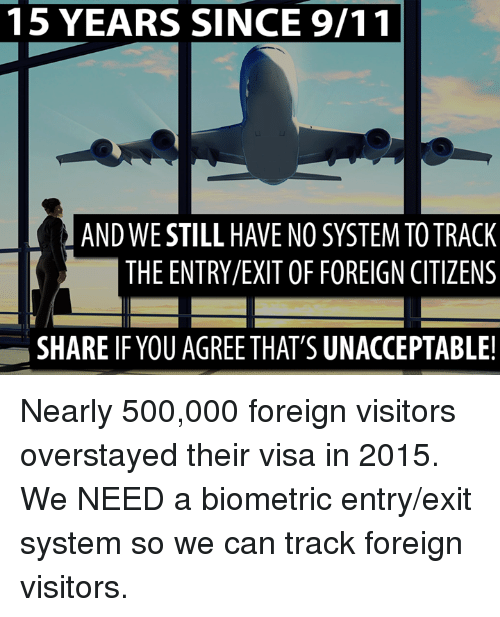 We NEED a biometric entry/exit system so we can track foreign visitors. Nearly 500,000 foreign visitors overstayed their visa in 2015. We NEED a biometric entry/exit system so we can track foreign visitors. 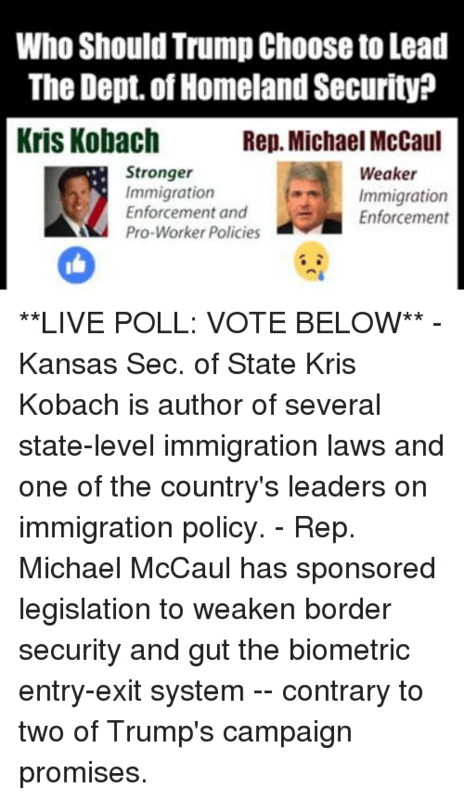 Memes, Homeland, and Immigration: Who Should Trump Choose to Lead The Dept of Homeland Security Kris Kobach Rep. Michael McCaul Stronger Weaker Immigration t Immigration Enforcement and Enforcement Pro-Worker Policies **LIVE POLL: VOTE BELOW** - Kansas Sec. of State Kris Kobach is author of several state-level immigration laws and one of the country's leaders on immigration policy. - Rep. Michael McCaul has sponsored legislation to weaken border security and gut the biometric entry-exit system -- contrary to two of Trump's campaign promises. 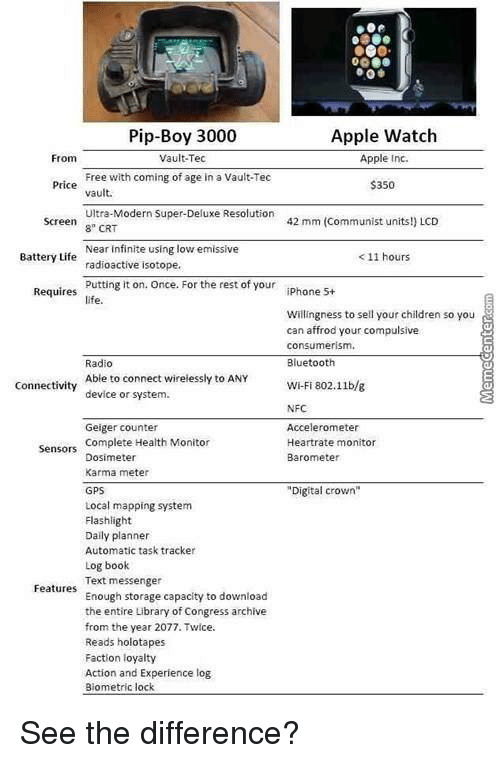 Apple, Apple Watch, and Bluetooth: Pip-Boy 3000 Apple Watch Vault-Tec From Apple Inc. Free with coming of age in a Vault-Tec Price $350 vault. Ultra-Modern Super-Deluxe Resolution Screen s CRT 42 mm (Communist units!) LCD Near infinite using low emissive Battery Life 11 hours radioactive isotope. putting it on. Once. For the rest of your Requires iPhone 5+ life. Willingness to sell your children so you can affrod your compulsive consumerism. Bluetooth Radio Able to connect wirelessly to ANY WiFi 802.11b/g Connectivity device or system. NFC Accelerometer Geiger counter sensors Complete Health Monitor Heartrate monitor Barometer Dosimeter Karma meter "Digital crown" GPS Local mapping system Flashlight Daily planner Automatic task tracker Log book Text messenger Features Enough storage capacity to download the entire Library of Congress archive from the year 2077. Twice. Reads holotapes Faction loyalty Action and Experience log Biometric lock See the difference?